The Cultural Arts Center is housed in a renovated building that connects us to the earliest plans and places in our community's history. In 1812, the high east bank of the Scioto River was designated as the capitol of the new State of Ohio. In 1814, Columbus' first penitentiary was built on this plot of land only to be razed in the 1850's when The Ohio State Penitentiary was built at the corners of Spring and Neil Streets. In 1861, this building, one of the first Ohio State Arsenals, designed specifically for the storage of arms, was completed at a cost of $14,000. It continued to operate as the Ohio State Arsenal until the mid-1970s. In 1973, Melvin B. Dodge, then Director of the Columbus Recreation and Parks Department, toured the Arsenal and saw its unique possibilities. 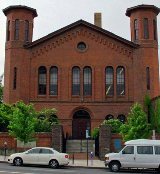 At the time, the Columbus Recreation and Parks Department's very popular Adult Art Center was housed in a restored firehouse on Oak Street. The community glowed with praise for the artists and professional atmosphere that had emerged serendipitously in the proximity of our local art college. The firehouse was operating above capacity, serving hundreds of adults in various art classes each year. Dodge decided to move the Art Center from the over-crowded firehouse into the capacious Arsenal. By 1975, at Governor James A. Rhodes’ order, the National Guard and the State of Ohio had negotiated a 99-year lease arrangement with the Columbus Recreation and Parks Department. The City of Columbus raised $250,000 to secure the development of the Center, and then Mayor Tom Moody signed the 99-year lease agreement for the sum of $1.00 per year. In 1976, Schooley-Cornelius Associates were chosen as architects from a field of eleven area architectural proposals. On December 24, 1976, the United States Department of Commerce for Economic Development Administration awarded a grant of $1,371,733.00 for Phase II of the renovation, and contract for the work was awarded to the Altman-Coady Company. The Ohio State Arsenal was officially dedicated as the Columbus Cultural Arts Center on Monday, June 11, 1978. However, saving and transforming this beautiful, historic building is only part of the story. The Oak Street Adult Art Center is where the rest of the story begins. In 1962, 12-year-employee Dora Rosenfield became Director of the Arts Center, and began recruiting the staff of professional artists that would create the environment that still animates the core idea of a center for making art, directed at adult audiences, and promoting the highest standards of expression. The staff was composed of working artists who were committed to their own studio practices and came to their teaching from this perspective. The teaching philosophy is workshop-based and represents a long tradition of hands-on studio experience. Today, our CAC Faculty bring diverse talents and expertise to our Studios, always with the commitment to helping our students create the best art they can achieve. Nestled in the northeast corner of our courtyard sits the bell off the USS Columbus, a guided missile cruiser. It was used to ring in the local bicentennial celebration on July 4, 1976. G.C. 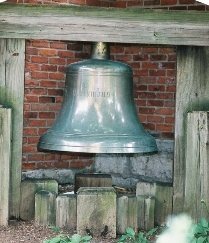 Heffner, past vise president of the Navy League, requested the bell be sent to Columbus after the cruiser was decommissioned in January 1975. The bell is on loan to the Cultural Arts Center from the Naval Historical Center, Department of the Navy, at the Washington DC Navy Yard. 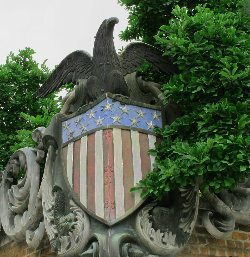 This ornate eagle and shield on the outside northeast corner of our brick courtyard, once decorated the US Battleship Ohio. The ship was decommissioned in 1900 and the eagle was mounted on the Arsenal wall in 1923. As part of the renovation project, five women's service organizations made it possible for James Mason, Bronze Casting Instructor, to restore it to the beauty you see today.